This is “All Anxiety Is Not the Same: Sources of Communication Apprehension”, section 3.2 from the book Public Speaking: Practice and Ethics (v. 1.0). For details on it (including licensing), click here. Distinguish among the four different types of communication apprehension. Identify various factors that cause communication apprehension. We have said that experiencing some form of anxiety is a normal part of the communication process. Most people are anxious about being evaluated by an audience. Interestingly, many people assume that their nervousness is an experience unique to them. They assume that other people do not feel anxious when confronting the threat of public speaking.McCroskey, J. C. (2001). An introduction to rhetorical communication. Boston, MA: Allyn & Bacon. Although anxiety is a widely shared response to the stress of public speaking, not all anxiety is the same. Many researchers have investigated the differences between apprehension grounded in personality characteristics and anxiety prompted by a particular situation at a particular time.Witt, P. L., Brown, K. C., Roberts, J. B., Weisel, J., Sawyer, C., & Behnke, R. (2006, March). Somatic anxiety patterns before, during and after giving a public speech. Southern Communication Journal, 71, 87–100. McCroskey argues there are four types of communication apprehension: anxiety related to trait, context, audience, and situation.McCroskey, J. C. (2001). An introduction to rhetorical communication. Boston, MA: Allyn & Bacon. If you understand these different types of apprehension, you can gain insight into the varied communication factors that contribute to speaking anxiety. Some people are just more disposed to communication apprehension than others. As Witt, Brown, Roberts, Weisel, Sawyer, and Behnke explain, “Trait anxietyAnxiety prompted by a personality trait that describes how people generally feel about communication across situations and time periods. measures how people generally feel across situations and time periods.”Witt, P. L., Brown, K. C., Roberts, J. B., Weisel, J., Sawyer, C., & Behnke, R. (2006, March). Somatic anxiety patterns before, during and after giving a public speech. Southern Communication Journal, 71, 88. This means that some people feel more uncomfortable than the average person regardless of the context, audience, or situation. It doesn’t matter whether you are raising your hand in a group discussion, talking with people you meet at a party, or giving speeches in a class, you’re likely to be uncomfortable in all these settings if you experience trait anxiety. While trait anxiety is not the same as shyness, those with high trait anxiety are more likely to avoid exposure to public speaking situations, so their nervousness might be compounded by lack of experience or skill.Witt, P. L., Brown, K. C., Roberts, J. B., Weisel, J., Sawyer, C., & Behnke, R. (2006, March). Somatic anxiety patterns before, during and after giving a public speech. Southern Communication Journal, 71, 87–100. People who experience trait anxiety may never like public speaking, but through preparation and practice, they can learn to give effective public speeches when they need to do so. Context anxietyThe anxiety prompted by specific communication contexts such as group discussions, interpersonal interactions, or public speaking. refers to anxiety prompted by specific communication contexts. Some of the major context factors that can heighten this form of anxiety are formality, uncertainty, and novelty. Some individuals can be perfectly composed when talking at a meeting or in a small group; yet when faced with a more formal public speaking setting, they become intimidated and nervous. As the formality of the communication context increases, the stakes are raised, sometimes prompting more apprehension. Certain communication contexts, such as a press conference or a courtroom, can make even the most confident individuals nervous. One reason is that these communication contexts presuppose an adversarial relationship between the speaker and some audience members. In addition, it is hard to predict and control the flow of information in such contexts, so the level of uncertainty is high. The feelings of context anxiety might be similar to those you experience on the first day of class with a new instructor: you don’t know what to expect, so you are more nervous than you might be later in the semester when you know the instructor and the class routine better. Additionally, most of us are not experienced in high-tension communication settings. The novelty of the communication context we encounter is another factor contributing to apprehension. Anxiety becomes more of an issue in communication environments that are new to us, even for those who are normally comfortable with speaking in public. Most people can learn through practice to cope with their anxiety prompted by formal, uncertain, and novel communication contexts. Fortunately, most public speaking classroom contexts are not adversarial. 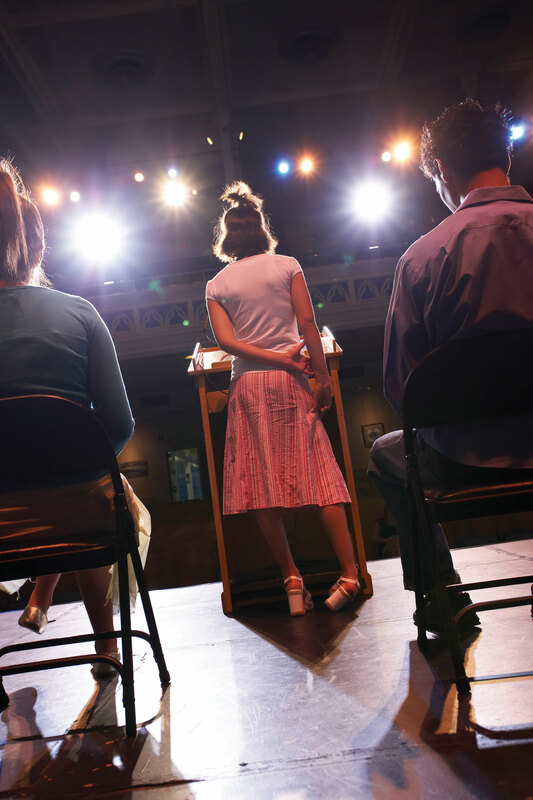 The opportunities you have to practice giving speeches reduces the novelty and uncertainty of the public speaking context, enabling most students to learn how to cope with anxiety prompted by the communication context. For some individuals, it is not the communication context that prompts anxiety; it is the people in the audience they face. Audience anxietyThe communication apprehension prompted by specific types of audiences. describes communication apprehension prompted by specific audience characteristics. These characteristics include similarity, subordinate status, audience size, and familiarity. You might have no difficulty talking to an audience of your peers in student government meetings, but an audience composed of parents and students on a campus visit might make you nervous because of the presence of parents in the audience. The degree of perceived similarity between you and your audience can influence your level of speech anxiety. We all prefer to talk to an audience that we believe shares our values more than to one that does not. The more dissimilar we are compared to our audience members, the more likely we are to be nervous. Studies have shown that subordinate status can also contribute to speaking anxiety.Witt, P. L., Brown, K. C., Roberts, J. B., Weisel, J., Sawyer, C., & Behnke, R. (2006, March). Somatic anxiety patterns before, during and after giving a public speech. Southern Communication Journal, 71, 87–100. Talking in front of your boss or teacher may be intimidating, especially if you are being evaluated. The size of the audience can also play a role: the larger the audience, the more threatening it may seem. Finally, familiarity can be a factor. Some of us prefer talking to strangers rather than to people we know well. Others feel more nervous in front of an audience of friends and family because there is more pressure to perform well. Situational anxietyCommunication apprehension created by the specific combination of audience, time, and setting., McCroskey explains, is the communication apprehension created by “the unique combination of influences generated by audience, time and context.”McCroskey, J. C. (2001). An introduction to rhetorical communication. Boston, MA: Allyn & Bacon, p. 43. Each communication event involves several dimensions: physical, temporal, social-psychological, and cultural. These dimensions combine to create a unique communication situation that is different from any previous communication event. The situation created by a given audience, in a given time, and in a given context can coalesce into situational anxiety. For example, I once had to give a presentation at a general faculty meeting on general education assessment. To my surprise, I found myself particularly nervous about this speech. The audience was familiar to me but was relatively large compared to most classroom settings. I knew the audience well enough to know that my topic was controversial for some faculty members who resented the mandate for assessment coming from top administration. The meeting occurred late on a Friday afternoon, and my presentation was scheduled more than an hour into the two-hour meeting. All these factors combined to produce situational anxiety for me. While I successfully applied the principles that we will discuss in Section 3.3 "Reducing Communication Apprehension" for managing stage fright, this speaking situation stands out in my mind as one of the most nerve-wracking speaking challenges I have ever faced. Communication apprehension stems from many sources, including the speaker’s personality characteristics, communication context, nature of the audience, or situation. Many factors exaggerate communication apprehension. Formality, familiarity, novelty, perceived similarity, and subordinate status are a few of the factors that influence our tendency to feel anxious while speaking. Make a list of sources of your communication apprehension. What factors contribute most to your anxiety about public speaking?